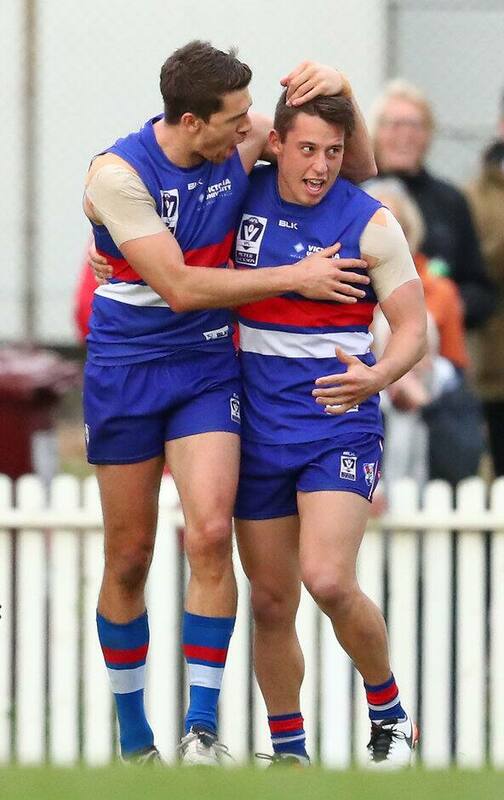 Footscray's flying semi final finish Watch highlghts of the Footscray Bulldogs' six goal to one final term, to overcome a 18-point deficit and defeat Essendon to progress to the VFL Preliminary Final next weekend. Midfielder Nathan Hrovat kicked the match-winning goal from the tightest of angles in Footscray's come-from-behind 19-point triumph. Hrovat improved the angle and slotted the set shot from the boundary after Bomber Jake Long's errant kick landed out of bounds on the full. The Bulldogs trailed by 18 points at three-quarter time, but had the momentum in the final quarter and overran the tiring Bombers. Bulldogs Lukas Webb, Roarke Smith and Toby McLean were late withdrawals from the clash as the club looks for suitable options to replace injured midfielder Lin Jong (collarbone). Veteran Jed Adcock controlled the ball in the tense final quarter, working in tandem with Mitch Honeychurch. Forward Bailey Dale was reliable in attack, using his strong overhead marking ability to slot three first-half goals, while Koby Stevens, who was omitted from the Bulldogs' elimination final squad against West Coast, was kept relatively quiet. Footscray takes on Collingwood in next Saturday's preliminary final at North Port Oval. Will Minson Seven disposals, six tackles, 24 hitouts.